Primer Pro helps you make better primers with much less effort. It does the searching, counting and listing work for primer writers. Making good primers requires much work: listing words according to the letters they contain, and keeping track of which letters have been taught so far. Primer Pro does this for you, making it easy to create primers that follow sound teaching principles. When you put lots of care into developing a primer, learning to read is easier for the learner. Primer Pro has the ability to search for words of a particular part of speech and particular linguistic feature. For example, if you’re developing learners’ auditory and visual awareness of a tone or a particular vowel, Primer Pro can find all the nouns containing only the tone or particular vowel. You are then given a list of nouns which you can associate with pictures for keywords. 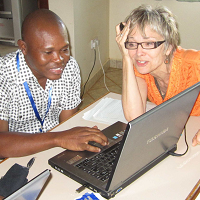 Henry Koroso is using Primer Pro to find words that are suitable for a Swahili primer. 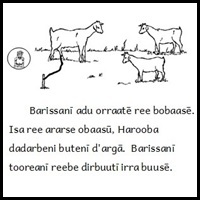 Primer Pro can analyze the words in a language and suggest a good sequence for teaching the letters. It will keep track of which letters are to be included in each primer, and can check stories for any letters which haven't yet been taught. Primer Pro can suggest words that would be good buildable words for each primer lesson. It does this by searching a big wordlist and finding all the words that only contain letters which have been taught so far. This is a very valuable feature of PrimerPro. In the process of drafting basic primers PrimerPro proved to be a very useful tool to me. PrimerPro is user friendly and can be handled easily by an average computer literate person. I have used PrimerPro for primers in three Bantu languages and one Chadic language (Lis ma Ron) and I will certainly use it again. Can PrimerPro help me write pre-primers? Yes! 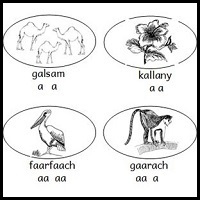 It can produce all the pictureable nouns containing only the vowel being taught, such as 'mbata', if the letter a is being taught, or 'kaana' if aa is being taught. Is PrimerPro useful for writing transition primers? Yes! It can search for minimal pairs for anything you need to contrast. It's proven especially useful for showing readers that two different tone marks make a big difference in meaning, for example.